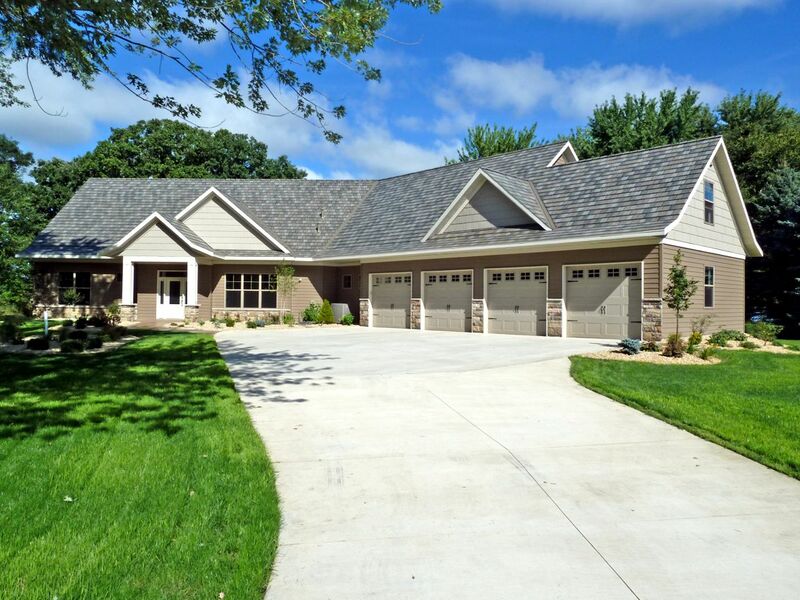 This waterside home features a glistening metal slate roof offset with copper accents. 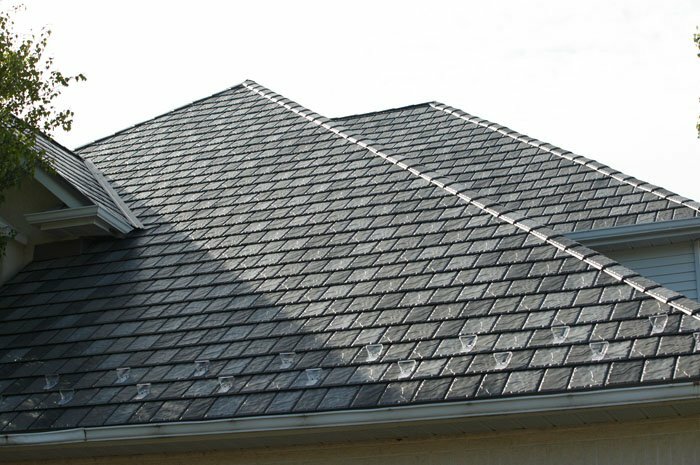 Edco Arrowline Enhanced Slate, the product shown here, is available at Metal Roof Outlet in Ontario. 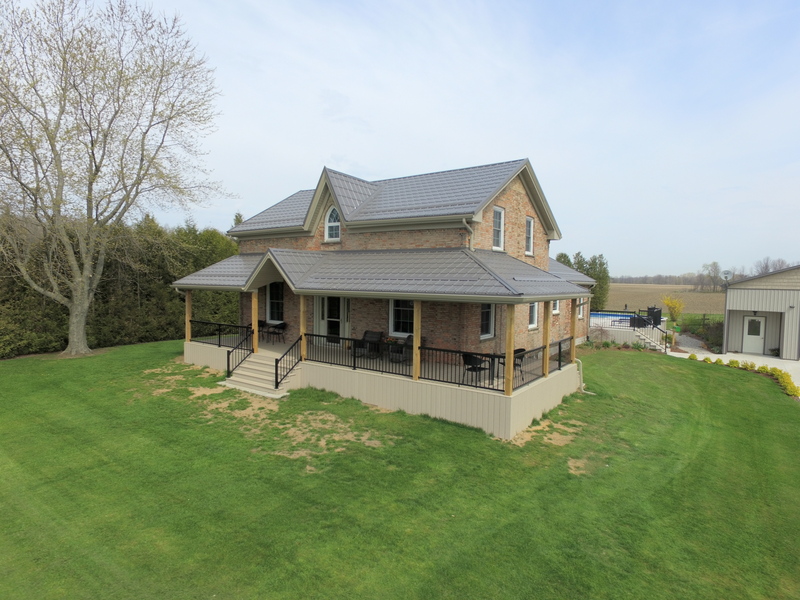 This rural, cottage-style home features natural wood beams and a metal slate roof in the colour Charcoal Gray Blend, available at Metal Roof Outlet in Ontario. 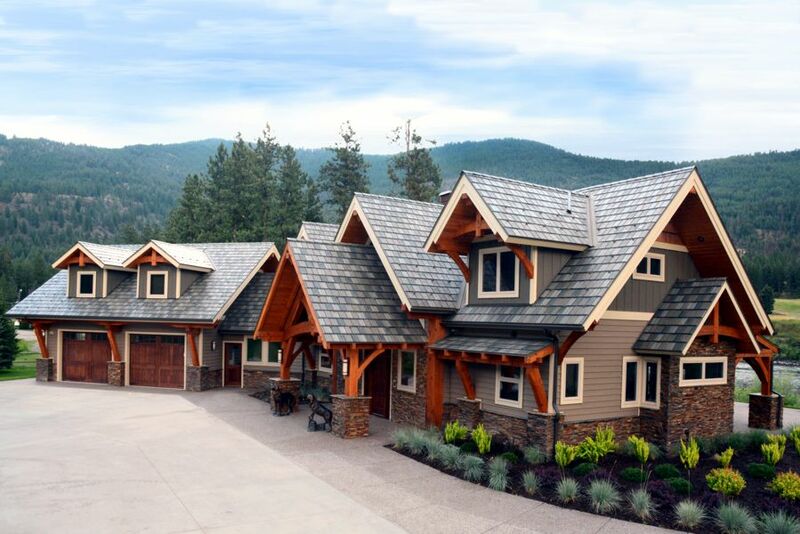 This sprawling, gabled bungalow is topped with a durable slate-style metal roof in the colour Charcoal Gray Blend. 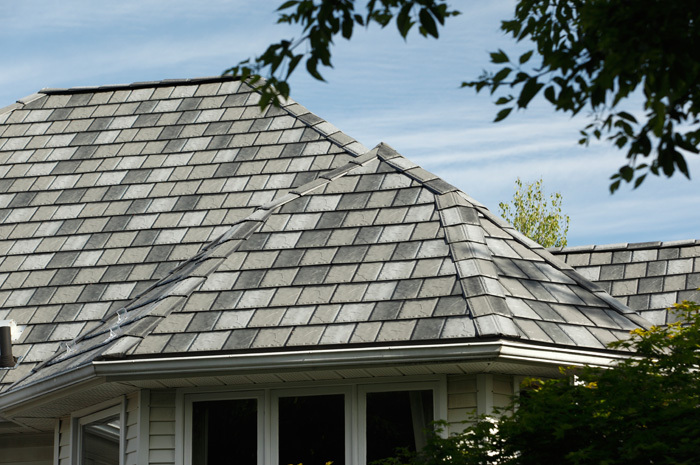 Visit Metal Roof Outlet in Ontario to find out more about this product! 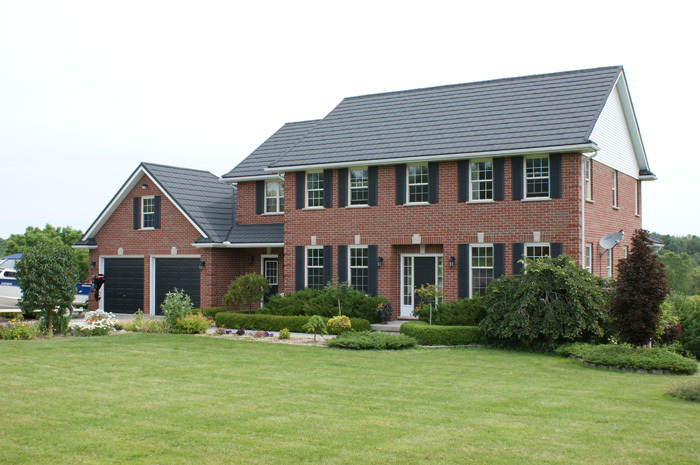 This two story Ontario home with peachy brick has a Metal Slate roof in the colour Charcoal by Metal Roof Outlet. 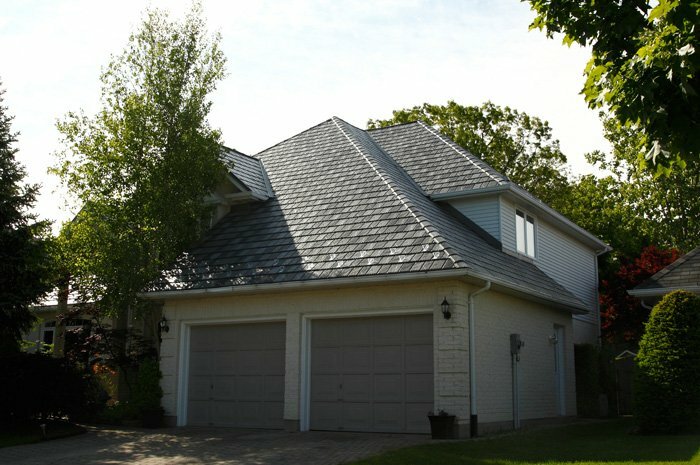 Metal roofs can mimic almost any material or finish you prefer – including a traditional slate-style roof as seen on this Ontario home. 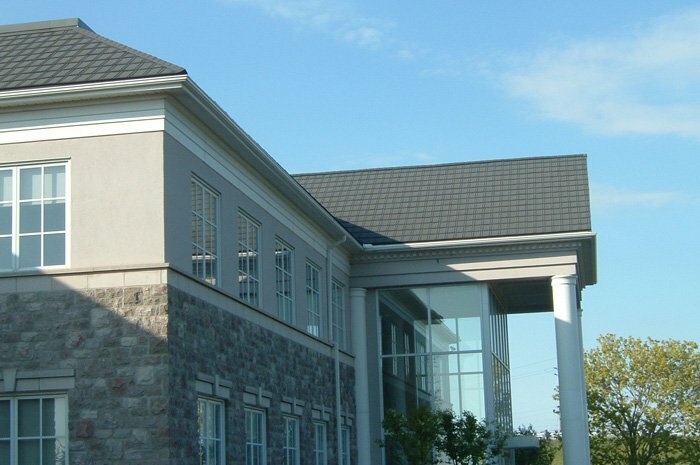 Take a closer look at our slate-style steel – we are proud to offer the texture and gentle shading variances that people want from a natural slate roof. The linear look of the siding on this Ontario home is complemented by the grid of slate-style steel from Metal Roof Outlet. This classic cottage maintains its antique charm without sacrificing durability with a slate-styled steel from Metal Roof Outlet, Ontario. 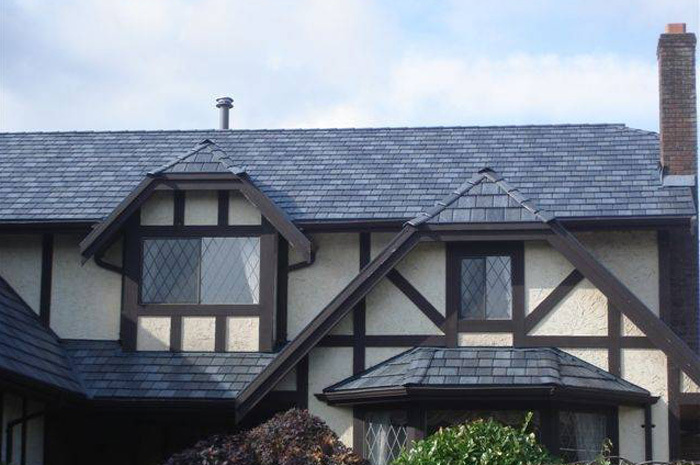 Tudor houses are traditionally roofed in slate – bring that classic style into the 21st Century with a slate-look steel roof from Metal Roof Outlet, Ontario. 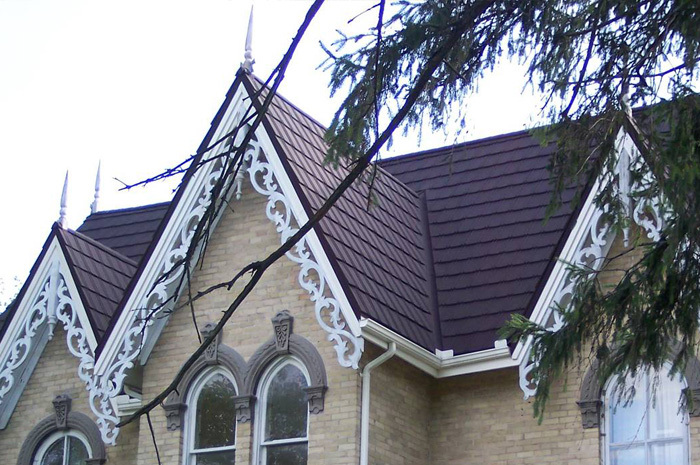 Metal Roof Outlet can offer slate-style metal roofs in a variety of colours – you can even get a mix of shades in one roof like this Ontario home. 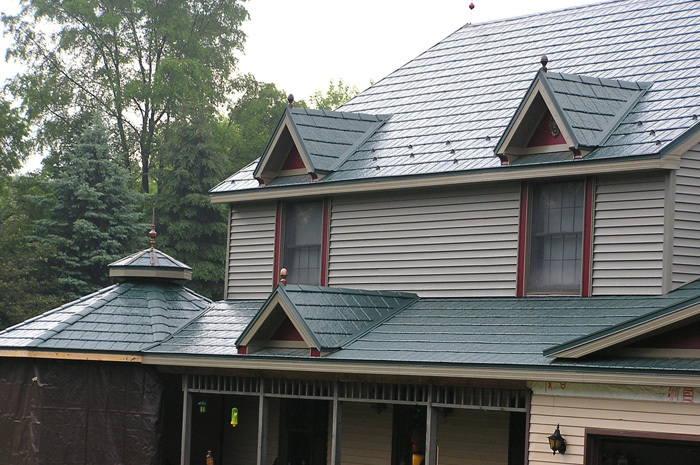 Here is a closer look at that beautiful slate-style metal roof. 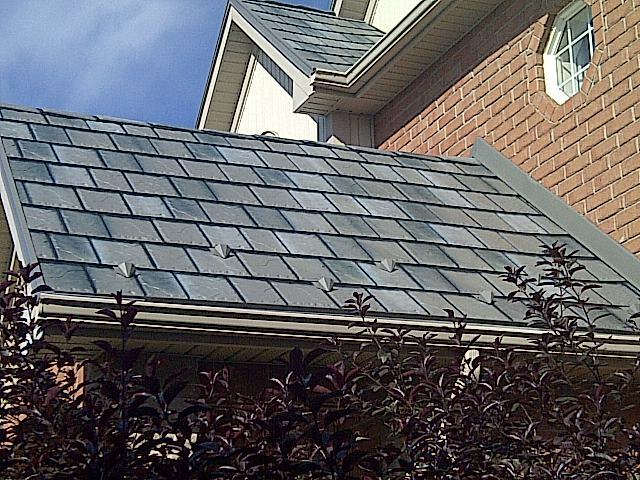 This Ontario home has a beautiful slate-style steel roof from Metal Roof Outlet which catches the late afternoon sun. 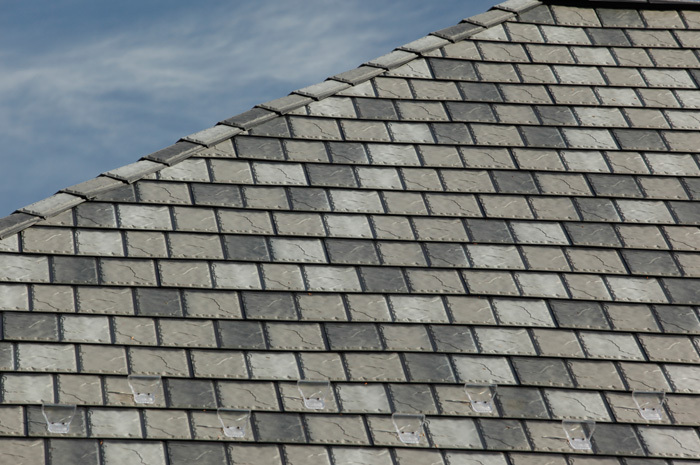 Here is a closer look at the traditional-looking high-quality steel slate roof. 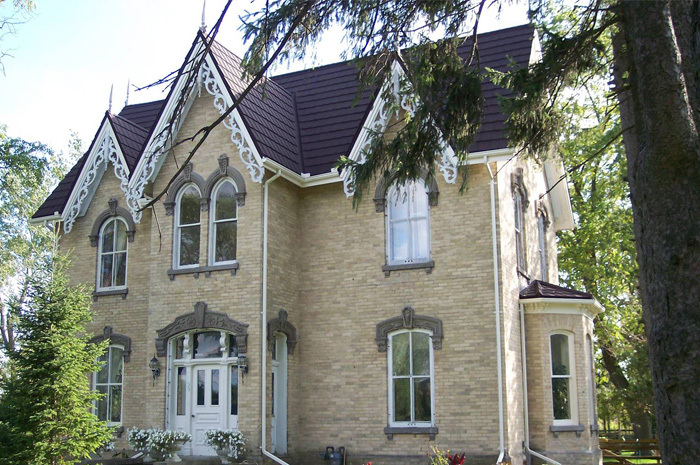 This beautiful yellow brick century home has tons of classic details – they preserved the beauty of their home while upgrading quality to a slate-look metal roof from Metal Roof Outlet Ontario. The stately glassed-in entryway of this Ontario home required an equally striking dark slate-style roof from Metal Roof Outlet. 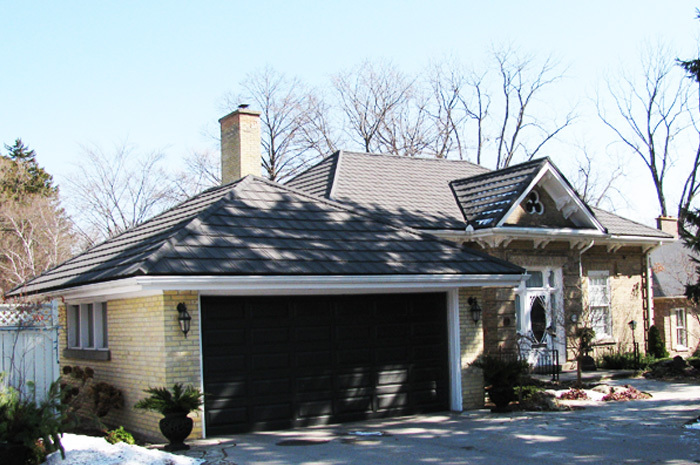 This yellow brick cottage in Ontario features a beautiful slate-style roof from Metal Roof Outlet. 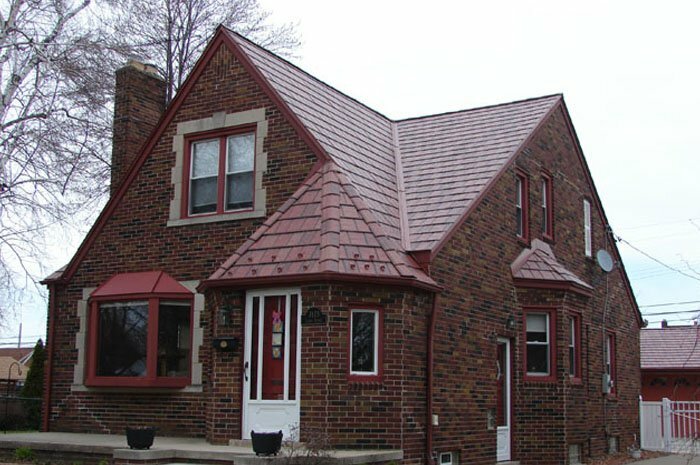 This beautiful two-story red brick home in Ontario features a slate-style steel roof from Metal Roof Outlet.